As in Oropos, where the local population showed the way we should treat corporate traffic blocks protected by cops, that is, motorway tolls. In the same manner, a bit westward in Italy, Switzerland and France, a local movement has resisted for many years now environmental degradation and the construction of high-speed rails. 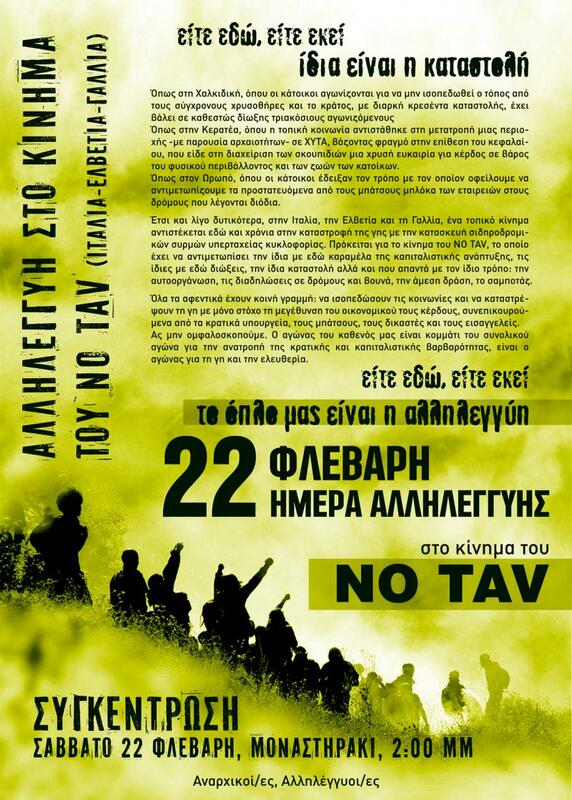 It’s the NO TAV movement that is exposed to the same kind of saga, namely capitalist development, the same kind of persecutions as in Greece, the same kind of repression. However, NO TAV also responds with the same tactics: self-organisation, street and mountain protests, direct action, sabotage. All bosses follow a common path: to demolish societies and destroy the environment solely aiming to maximize economic growth and profits. These actions are backed up by state ministries, cops, judges and prosecutors. Let’s stop navel-gazing. Every single struggle is part of the overall struggle to subvert state and capitalist barbarism, it’s a struggle for land and freedom. Either here, or there, solidarity is our weapon!